Station Hollywood: Nirmala Mishra shared her musical experience before media. Nirmala Mishra shared her musical experience before media. Nirmala Mishra said Carribean humming gave her song “emon ekta jhinuk”. Eminent singer Nirmala Mishra gave an exclusive interview in Anandabazar Patrika on 16th October, 2011. At an age of 73 years she talked about many unknown facts. She disclosed that her father Mohinimohan Mishra was Pandit, Sangeet Ratna and Sangeet Nayak. He went to Benaras to get those degrees in music. Nirmala Mishra’s second brother who was also a great talented singer was given poison and did not survive, otherwise would have been a great singer. She was very mischievous during childhood, that was the reason she was called “jhamela”. She got typhoid 6 times, for that reason her eyesight was affected. Everyone prescribed her to sing light songs, but her father was upset as he was an eminent classical singer. Ustad Bade Ghulam Ali Khan had many times given her medicine for voice. 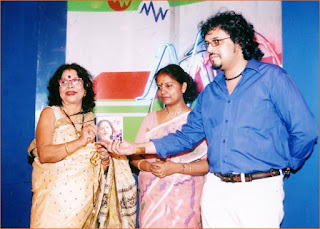 Eminent singer Dhananjoy Bhattacharya had helped her in her initial days of career. When composer Nochiketa Ghosh composed a song and asked her whether she could do Carribean humming, she said yes. Nochiketa Ghosh thought about Lata Mangeshkar for the song. But she did the humming, and got the song “emon ekta jhinuk khuje pellam na”. It became super hit. In the same way she got the song “o tota pakhire” from the brilliant composer Prabir Mojumdar. She was called by superstar Uttam Kumar a number of times in his own house whenever Supriya Debi cooked a delicacy of prawns. She was asked to sing songs many times. She talked about her husband also who wrote the song “ami je tomar chirodiner hasi kannar saathi” which was later recorded and became a big hit. Nirmala Mishra said that just as Lata Mangeshkar was called the melody queen of Mumbai, Sandhya Mukherjee the melody queen of Kolkata, similarly she was considered the melody queen of Orissa. She had sung many Oriya songs and majority of them had become hits.